"Three sisters. Their mother’s dying wish. One last chance to be a family…Meet the daughters of Iris Parker. Dee; sensitive and big-hearted; Rose uptight and controlled and Fleur the reckless free spirit. At the reading of their mother’s will, the three estranged women are aghast to discover that their inheritance comes with very tricky strings attached. If they are to inherit her wealth, they must spend a series of weekends together over the course of a year and carry out their mother’s ‘bucket list’. But one year doesn’t seem like nearly enough time for them to move past the decades-old layers of squabbles and misunderstandings. 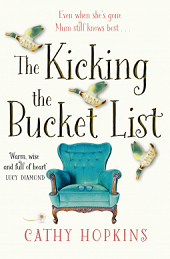 Can they grow up for once and see that Iris’s bucket list was about so much more than money…"
This book is author Cathy Hopkins' first book for adult, after having written successfully in the teen genre before. I have to admit I wasn't too taken with the cover for this one, it didn't exactly draw me into the book, but I really liked the idea of it, so was determined to ignore my cover judgments and read on regardless! Luckily, the story inside didn't disappoint, and I found it to be a very good read, and while it may perhaps be a bit raw if you have recently lost your own mother, it was an ultimately uplifting family-centric read. The book is the story of 3 sisters - Dee, Rose and Fleur. They don't really speak any more, and have lost touch, all settling into their own lives. However, their mother Iris has left a stipulation in her will that the sisters have to spend a set amount of time together in order to gain their inheritance, which some of the women need more than others. They're all initially very doubtful that they can make it work, but know that for their mother's sake, they have to make a go of it and at least try. But is it just too big an ask for sisters who seem destined to never be close? The family dynamic throughout this book was very interesting to read. I am quite close to my brother so I couldn't contemplate being like Rose, Dee and Fleur are with each other throughout this book. The fact they don't have a clue about the big things going on in each others lives is quite sad, and I would never want to be like that personally. However, I was pleased that they were willing to give their family another chance, even if it was only for the reasons of inheritance, and was hopeful of a nice family reunion. Each of the women were very different. There's free spirit Dee, an artist who loves her home in Cornwall but is scared of losing it; Rose, the serious sister who works all hours God sends and finally Fleur, the property magnate who lives a free and single life, and loves it. The book was quite an emotional read, with each of them struggling to come to terms with the death of their beloved mother, and it made me very grateful that I am yet to have to deal with a loss like that. It didn't seem to matter how successful or well off they are in their private lives, the loss hit them so hard, and it was heart-breaking in times to read their grief and sorrow. Another poignant part of the book involves one of the sisters hiding a painful secret from the other two, I wished she would confide in them, it was very hard to read as she felt she wasn't in a place to ask for help from the people she should always be able to ask for it from. For me, there were parts of the narrative that went on a little bit too much, and I felt this bogged the book down in the middle part for a while. I found it heavy-going, and some of it could have been lifted without losing the general gist of what was happening. I did find myself putting it down a few times and going back to it, but finally it did pick up the pace again, and kept going towards a very eye-opening finale. The narrative switches up between the three sisters, although the main narrator is Dee, and I enjoyed the way it switched up and kept it fresh. For me, this was an enjoyable book. It was an emotional read, but one I definitely enjoyed reading. There were funny bits that made me laugh out loud, some that made me cry, and poignant storylines that were believable yet very sad. A book that highlights the importance of family, of love and of treasuring what we have whilst we have it. A wonderful book. "Hunter's Moon is the ultimate 'forever' house. Nestled by a river in the Peasebrook valley, it has been the Willoughbys' home for over fifty years, and now estate agent Belinda Baxter is determined to find the perfect family to live there. But the sale of the house unlocks decades of family secrets - and brings Belinda face to face with her own troubled past. 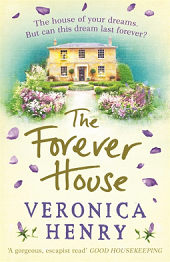 . ."
I adore Veronica Henry's books, so when I was sent a review of her brand new book The Forever House, I was so excited to get stuck in and read it. It certainly disappoint, and it's my probably my favourite of Veronica's books so date, there was just something so brilliantly readable about it, with characters you can truly love, that left me not wanting to put it down each night, I couldn't stop reading! Here is why I think The Forever House is a must read for the summer. What I loved about this book from the beginning was the warmth about the whole thing. Everything, from Belinda's tale in the present day, trying to sell Hunter's Moon and be respectful to its current owners, to the flashbacks to the hey-day of the house, and the family who occupied it - it was wonderfully written, with love, family and warmth flowing through the heart of the whole thing. I became quickly engrossed in the lives of these people, eager to find out what would happen to some elements of the story, although I truly didn't want to leave this book behind. The book has two narratives. There's the present day one of Belinda, an estate agent who has a reputation in town for being a great seller, yet respectful to the owners, determined to find the right person for the right home. She loves Hunter's Moon herself, and knows it needs someone special to buy it, even more so when she finds out the plight of the current owners. Belinda clearly had a troubled past herself, which isn't revealed for much of the book, but you can always sense an aura of sadness around her, like something is missing in her life. I found her very likeable, I was willing for her to ensure Hunter's Moon went to someone who deserved it, because the house sounded wonderful, and Veronica Henry's descriptions of it make it sound like my dream home, just perfect in every way. As well as this modern day story, we also flash back to the lives of the occupants of the house quite a few years back. The family living there, the Willoughby's, are quite decandent, with mother Margot being a famous author, and her children living off this money and her reputation. But all isn't as it seems under the roof of Hunter's Moon, and the cracks in the family are seriously beginning to show. Sally and Alexander's story, the couple who are selling the house in the up-to-date story, are young children in this, and its fascinating to read the start of their relationship, and how they came to be at Hunter's Moon together. The storyline takes some twists and turns, and as it hurtles to its conclusion, I just couldn't put it down, I found it very compulsive as I loved the Willoughby's so much! The book is a joy to read, and left me with such a warm feeling inside as I turned the last page. I loved the whole atmosphere of this book, about how important a home can be to people, that it is the place you always return to when you need to. Belinda's whole ethos about selling a home to the right people rings true for me too, you just know when its right, and she was determined to find the right people for a very special home. Veronica's writing is stunning in this one, you can immerse yourself in the lives of the house, the characters... it's just perfect escapist reading. I loved it, and it's definitely one of Veronica's best books for me, without a doubt. Bella can’t ignore the chemistry between her and Isaac, but she’s had her trust badly broken in her past. Will she run when she learns the truth about Isaac, or will he be the one man who can help Bella believe in love again? " 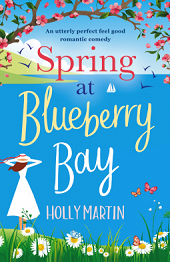 I was so excited to get a review copy of the first of Holly Martin's new 'Hope Island' series, called Spring at Blueberry Bay. I love Holly's stories because they are always full of romance, characters to love and stories that leave you with a huge smile on your face. That was certainly the case with this story, it could certainly be one of my favourite books yet, no mean feat, believe me. Bella lives on Hope Island, and after a recent scandal at work, she's desperately hunting a new job, knowing a bad reputation may be following her around. When she finds the perfect job, the interview is slightly different to what she expected, especially as she knows the manager Isaac, and he hasn't been exactly honest with her. Can Bella forgive his deception, or has Isaac made too big a mistake to fix? I loved the setting of Hope Island right from the beginning. I felt like I was really getting into the place in my mind as I was reading, imagining the village centre, the houses, the beautiful bay - it sounded idyllic, and Holly's settings are always somewhere that I love reading about. Bella's houses sounded delightful, and I can see why she wasn't so keen to leave there, despite her own financial hardship. The descriptions were beautifully written, it was a joy to read because of this. I don't want to say too much about Bella and her job opportunity and what happens with Isaac, as I loved that being revealed as I read the story, but the story was thoroughly enjoyable. The characters in the book are perfect, and every single one of them was vital for the book, from the main ones like Bella and Isaac, to the more minor villagers, and Bella's family. I looked forward to reading about all of them as they popped up, and it's nice knowing there's more of them to come in the next book set here. Bella was a brilliant character, and I could understand her reluctance to befriend Isaac after his deception, even though his heart was in the right place. I was willing for her to open up her heart though and let him in, they seemed like they would be a perfect couple. Isaac seemed like the perfect man too; handsome, has strict morals, a kind heart, rather wealthy and open to love. The stories that Holly Martin writes are always so positive, have lovely happy endings that warm your heart, and love stories that make you swoon. Although you can predict how it's going to end, it simply doesn't matter because they are so wonderful to read, and you simply want the best for these characters. I also love when Holly writes a series because you know you'll be seeing these characters again and finding out what they are up to next and if things have stayed as happy as you hoped! This was brilliant to read from beginning to end, I couldn't put it down each evening, it was that good! I hope Holly Martin continues to write stories for many years to come as I simply wouldn't want to be without them! Nat’s husband has just said the five words no one wants to hear – ‘I don’t love you anymore’. Picture-perfect Caroline has to welcome her estranged mother into her house after she was forced out of an exclusive nursing home. This spring, hope is coming!" 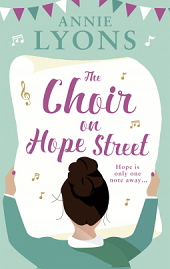 Another exciting eBook I was keen to read this year was the latest book from author Annie Lyons, called The Choir on Hope Street. It isn't Annie's first novel, but it is the first one I have read by this author. I had heard good things on Twitter about this book, and as someone who used to sing in choirs a lot when I was younger, I was looking forward to reading this one because it sounded just like my cup of tea. I have to confess to not being completely sold on the front cover, but I ploughed into it regardless. The story tells the tale of two women, in very different places in their lives but thrown together for one cause. Nat has been left by her husband, who has suddenly decided he doesn't love her anymore. She's devastated, and doesn't know how she's going to get through, sure that he will realise he's made a mistake. Then there's another mum at the school, Caroline, who from the outside seems to have the perfect life. But when her mother's nursing home says Caroline has to take her mother in as they can't cope anymore, her perfect life is thrown into disarray, and Caroline is forced to face up to some serious home truths. Together, however, the women are determined to save the local community centre, and set about raising some serious funds, starting with the new Hope Street Choir. Will the woman overcome their personal obstacles to save the centre for the good of everyone? I really enjoyed this book, and found the writing and the pace of the book to be very enjoyable throughout. I love how the story followed two very different women, united by one special cause. Too many local centres are being shut down these days due to lack of funding, and the way the ladies decide they have to save it and work together is very admirable, although a very big task! The creation of the Hope Street Choir sounds such fun, something I would love to do myself, and attracted all sorts of local people, some of which were fun to read about. My favourite of the two women was Nat. the woman who has been left broken-hearted by her husband, and now has to raise her son as single parent, a daunting prospect for anyone. I admired how strong she was, how determined she was for her son to keep his relationship with his father, despite their personal upheaval. It was hard to read her upset, but I admired how determined she was to save the community centre, and keep her mind focused. I did struggle to warm to Caroline, found her quite stand-offish and didn't like her attitude towards her sick elderly mother. As the story goes on, things are revealed which explain why Caroline is how she is, but for me it just sat uneasily. However, I think her story will probably resonate with a few readers. Outwardly, she seemed to have it all - head of the PTA, handsome husband, beautiful home, but inside, she was falling apart, especially regarding her mother. Annie Lyons' writing about Caroline's mothers suffering, and the effect it has on the family was so well written, and was an emotional read. The best part of the book, though, was the choir and their determination to win a competition which would secure funding to help save the community centre. I loved the competitive nature between the choirs, there was one in particular that did make me laugh out loud! I actually wish there was more of this throughout the book, but I did understand that the personal stories of Nat and Caroline were the main focus and obviously explained a lot about these characters. Annie Lyon's writing was excellent, she created a warm-hearted story with believable characters, and I found myself rooting for the choir to win and save the centre! I'll definitely be looking out for more from Annie Lyons, this was a great book, and one I can certainly recommend. "It’s Evie’s birthday and the start of a year she’ll never forget. An emotional story of love, friendship and grabbing life by the horns. Evie’s job has always been her safe haven. As a librarian in the little town of Becton she loses herself in books - after all it’s far easier to read about other people’s problems than set about solving her own. 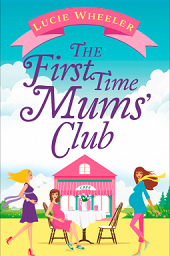 As Evie gets closer to Noah and discovering her mother, she must take a giant leap of faith. Can she embrace the new and make this her year of taking chances? And if she does, will she get her heart broken?" I read my first book by Christie Barlow a few months ago, that being her festive release Lizzie's Christmas Escape. 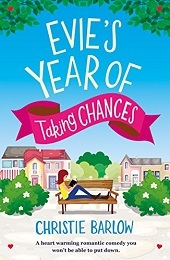 I absolutely loved it, Christie's writing style was perfect and I knew I would from then on be reading more of her books.m Luckily, her next book wasn't far behind, and this spring saw the release of her new book Evie's Year of Taking Chances. For what it's worth, I have to say how amazing Christie's covers are - in the age of eBooks, covers are again becoming hugely important in whether or not people choose to buy, particularly with an eBook, so these covers are an excellent choice. This book is obviously about Evie. She's a librarian (dream job! ), and happily lives alone round the corner from her adoptive mother. However, it's soon her birthday, a time which always makes her think of her biological mum. Evie eventually comes to the decision that she needs to try and make contact, even if that might mean rejection again. Meanwhile, Evie meets her all-time favourite author, Noah Jones, and the pair strike up a friendship. Evie is sure an author wouldn't be interested in her, but is her heart open enough to allow Noah in? If Evie manages to find her real mother, will it be a happy ending, or was taking a chance always destined to end in sorrow? Firstly, I loved that Evie is a librarian - in fact, I love it when authors make it obvious that their characters love books, and that was certainly the case with Evie, and her best friend too. The library where they work sounds lovely, and I can see why she loves going to work there. The inclusion of a famous author as another character adds another book-loving level to the book, and I thoroughly enjoyed this aspect of the book. Secondly, the hunt for Evie's biological was a great addition to the story, and I felt all the nerves along with Evie as she awaited letters, contact with her mum, I can't imagine how she must have felt, and she remained so positive despite her relatively bleak start in life. I can't say I would always be as optimistic as Evie was if I grew up as she did. Although the main character was of course very important to the book, I felt the other characters were just as good, and enjoyable to read about too. There's Evie's best friend Carla, who also works at the library, Aiden, a new recruit to the library, Evie's mum and of course Noah. Together, they are a really believable cast of people that you truly believe you could be friends with or hang out with, they're just normal and I thoroughly enjoyed reading about them. This was a brilliant book, and I enjoyed the whole thing from start to finish. Christie Barlow's writing was so easy to read, I found myself about to pick up the book at any time and dive straight back in, keen to get back into Evie's story and find out whether her chance taking would pay off. I found myself zooming through the book far too quickly, and felt sad once it had finished, simply because I had enjoyed the read so much. I already cannot wait to read more Christie Barlow, and have a few of her earlier stories on my Kindle to enjoy at some point. 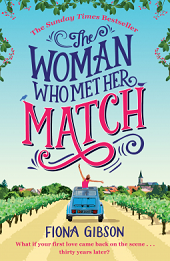 Barlow is certainly a talent that Bookouture will want to hang on to, with her lovely stories, and wonderful characters, she's an author I'll be reading for many years to come. Georgia has just been offered the opportunity of a lifetime! She'll be starring in a TV adventure travel show that will put her and Ben's business well and truly on the map. But Georgia's not quite sure their relationship is ready to be put under the microscope - because even though they survived their first argument the discovery of a sparkling engagement ring in Ben's suitcase has put Georgia's head in a spin! Are they really ready for marriage? And more importantly, after all the heartbreak, is she? This journey is sure to be an adventure like no other. Against the backdrop of rugged and wild Chile, Ben and Georgia must decide if their love is worth fight for... "
The final part of Katy Colins' Lonely Hearts Travel Club series was released later last year, and was entitled Destination: Chile. It features the same characters we have seen in the previous two books, Georgia and her boyfriend Ben, but this time we see them going to Chile on a new adventure. I love travel based books, particularly ones of destinations I haven't yet explored myself, and as I haven't read anything based in Chile before, I eagerly got stuck into this one, excited to explore a new country through the medium of books! Georgia and Ben are coming up against a few hurdles in their relationship, and the running of their travel agency. However, Georgia is sure the pair can make things work, and sets them up on their next holiday, but one with a twist. They're competing against a few other couples as part of a TV show, which is taking part in Chile. When Georgia discovers a beautiful ring stuffed in the back of Ben's drawer, she's sure he is going to pop the question on holiday. But as the holiday progresses, and Georgia is finding it harder than she thought, are the pair truly heading for marital bliss, or more woe? This book felt quite different to Katy's previous books, perhaps because of the added television show element, or the lack of happiness between the main couple, but I found it very compulsive reading! I was desperate to find out what was going to happen, and whether Ben and Georgia would win the competition, and even stay together against the odds! As always, I thoroughly enjoyed Katy's writing, she brought the couple to life so well on the page, they were very believable together, and the odd tiff felt real because we all have the odd drama in her relationships. I enjoyed the competition element of the book very much, and certainly had me laughing out loud in several places, and cringing in a few as well! The banter between all of the contestants was so much fun to read, as well as the challenges they all take part in. I certainly wouldn't have been as brave as Georgia was, and would have put my foot down to a few and said no! The challenges certainly lightened the atmosphere of the book, in between Georgia wondering when Ben was going to propose, and the small tiffs that the pair had, and I honestly really did laugh out loud a lot. Luckily, although this seems to be the last in the 'Lonely Hearts Travel Club' series, it seems our heroine Georgia is back again in Katy's brand new book, Chasing the Sun which is out now, and sat on my Kindle waiting to be read! I really love getting stuck into a book where I feel like I know the characters, and this is definitely how I feel when I pick up Katy's books, I can't wait to find out what Georgia is going to get up to next. 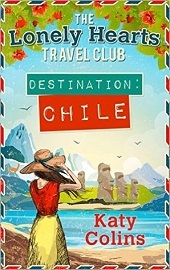 Katy's books are perfect for people like me, armchair tourists, because she really brings her destinations to life with her writing, and you can perfectly imagine the settings. Chile, in this book, sounds wonderful, and I can see why Georgia was so keen to get there, it sounds wonderful. A brilliant book to sit and enjoy this summer, Katy Colins is quickly becoming a must-read author for me! "Christie Chapman is a single working mother who spends her days commuting to her secretarial job in London and looking after her teenage son, Finn. It can be tough just getting through the day but Christie has always found comfort in her love of crafting and any spare time she has is spent in her parents' summerhouse working on her beautiful creations. From intricately designed birthday cards to personalised gifts, Christie's flair for the handmade knows no bounds and it's not long before opportunity comes knocking. All of a sudden Christie sees a different future for her and Finn - one full of hope and possibility, and if the handsome Max Alexander is to be believed, one full of love too. It's all there for the taking. Christie knows that something has to give, but what will she choose? Will she give up her dreams and the chance of real love? What price will she pay for doing the right thing? Can Christie find her happy ending in . . . Paper Hearts and Summer Kisses." It's not very often that I read a book and wish that I were able to rate it higher than my top rating, but that was certainly the case with Carole Matthew's latest book. 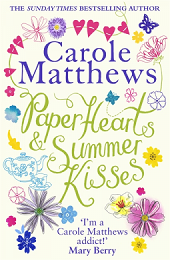 Paper Hearts and Summer Kisses is quite possibly my favourite book by Carole so far, no mean feat considering how much I have loved some of her other books, but for me, this was on a whole other level. I loved every page of it, it was compulsive from start to finish, and I have highly recommend it as one of those must-read summer books - simply brilliant, and here's why. Paper Hearts and Summer Kisses is the story of single mum Chrisie, who lives with her son Finn near to her parents, who often help her out with childcare when the need arises. Christie commutes every day into London to do a job she doesn't necessarily love, but does because it pays well. In her spare time, she loves to craft, and be with her son. So when the opportunity arises to work with a brand new crafting brand, to create some new lines, Christie grabs the chance with both hands. As she makes friends with her new American boss Max, Christie's world is completely turned upside-down, and she finds herself struggling. Will she be able to balance her work life with her home life, or does caring for the person who means the most means she has to give up her dreams? I don't want to spoil a lot about this story, because a lot of the joy in the book for me was not knowing what was coming, and therefore the storyline certainly hit me harder as it unfolds. I found a lot of similarities in myself and Christie, we're both single mums to boys, both hard workers, both have hobbies that allow us to be at home in our spare time, and are both very family orientated. This is why I think Christie's dilemma hit me so hard, it felt so real, and I felt like I was being put through the emotional wringer as I was reading. Christie's relationship with her son Finn was beautiful to read too, a very close relationship and one that a mother dreams of having with her own son. Now, I'm not a very crafty person myself, but Christie certainly is in the book. She loves to create things, use lots of embellishments in her work, and many of these are described throughout the book as Christie comes to terms with her new job, inventing exciting new products. I didn't have a clue what half of it meant, to tell you the truth, but I enjoyed imagining in my head my own version of the things that Christie was making! I also enjoyed reading about the friendship between Christie and her new boss, Max, who lives in the USA. I was hopeful perhaps she might open up her heart to him, but it seemed duty was win out with this tough, single mum. Carole Matthews writing was stunning throughout this book. she tapped perfectly into the psyche of Christie, her duty, her sense of obligation but also the lack of self-belief, and how hard her parents, especially her mother, encourage and believe in her, in whatever she does. To this end, the relationships in this book were so perfectly written, it filled my heart with warmth and joy, it was so nice to read of a family not at war with one another! Carole delves into the serious issues with the book so well, you feel every emotion along with these characters, but I always felt a glittering beacon of hope woven throughout, I was so hopeful everything would end and leave me with a big smile on my face. I don't want to say anymore as I don't want to spoil anything, except to say I cannot recommend this book enough, it is a true gem of a read, and you truly won't want to put it down. Uplifting, emotional, heart-wrenching and joyful all in one, one of my reads of the year, without a doubt. 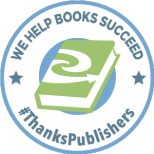 Chloe has read 0 books toward her goal of 100 books.